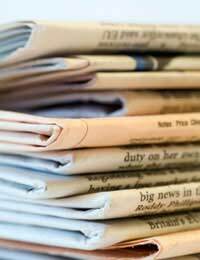 Budding actors, producers and sound engineers can all gain experience in Talking Newspapers. Talking Newspapers give blind and visually impaired people access to newspapers and magazines. Services across the UK depend on volunteers like you in a wide range of roles. Take an active role in serving your local community and gain valuable experience in the media. Talking Newspapers are local organisations run entirely by volunteers. There are around 500 in the UK. Hundreds of popular titles are available including national and local newspapers and magazines such as Reader’s Digest and BBC Gardener’s World. Volunteers produce over 2 million audio tapes each year. Work takes place in daytime and evenings too so roles are available for everyone including people who work full-time. Volunteers commit to a regular slot, usually once a week or once a month. As well as tapes many newspapers are made available on CD, as web downloads and as full-text on computers which can be accessed by blind people using screen readers. Although reading is the most popular task there are many exciting opportunities behind the scenes too. Readers are key to talking newspapers. You need basic literacy and a clear reading voice, which should be easy to listen to. There may be an audition and you will need to be able to work as part of a team. Volunteers work in a basic recording studio and use a microphone to record the newspaper. Time is needed before recording to read through items to check for difficult and unusual words. Usually readers work in teams of four to read a newspaper or magazine. This gives each reader breaks and adds variety for the listener. Often one side of tape contains news items while the other consists of magazine pieces. Contributor readers write their own pieces such as a travel experience or thoughts on local events and then read and record them. People often don’t realise that there are many other ways to volunteer with talking newspapers. In fact it can offer a good introduction to working in recording studios and the media. Experience isn’t usually required as training is usually available in-house. For example you can become a sound engineer. The sound engineer is responsible for the technical equipment and for audio quality and the recording process. The volunteer sets up microphones, understands the studio controls and can show others how to use them. The engineer will also carry out repairs and tests and be responsible for acquiring new equipment. An editor decides which articles are most relevant to listeners and worth recording. The editor’s skill is to choose enough items to fill the length of the tape and to edit out irrelevant words such as ‘today’ and others relating to time. Producers are in overall charge of the studio and recording. They give tasks to the news editor and engineers. They are also responsible for selecting the material that is recorded and for the overall sound quality and also ensure there are supplies of tapes available. There are many other vital roles in talking newspapers. For example someone is needed to make copies of the tapes using a special device. An administrator keeps records of listeners and their addresses and distributes tapes. They also erase returned tapes ready to recycle for reuse, keep any other records and paperwork, reply to letters and coordinate competition prizes. Sit on the organising committee as overall coordinator, secretary (to keep minutes and organise events) or treasurer (to manage finances). Help out with fundraising or get involved with publicity and PR to raise awareness of the service. Computer and IT skills are also valuable, especially for the creation of web downloads. If there isn’t already a local group then contact the Talking Newspaper Association of the UK for help and advice on setting up a studio in your community.